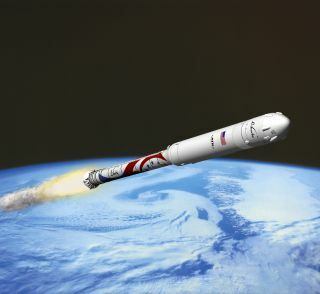 An artist's illustration of ATK's new Liberty rocket launching a private space capsule into low-Earth orbit. WASHINGTON — A design by Alliant Techsystems (ATK) was dropped from NASA’s shortlist of potential space station crew taxis because the company did not present a technically sound plan for combining existing rocket and spacecraft designs into a single transportation system, according to a NASA source selection document released Sept. 4. "I had some significant concerns about the lack of detail in some areas of ATK’s technical approach," William Gerstenmaier, associate administrator for NASA’s Human Exploration and Operations Mission Directorate, wrote in the document. "Basically, the proposal lacked enough detail to determine if a safe crew transportation system could be developed in a timely and cost effective manner out of the heritage components ATK selected for this concept." Gerstenmaier’s comments appeared in a July 31 source selection document detailing his reasons for passing over ATK and three less-known firms to pick Boeing, Space Exploration Technologies Corp. (SpaceX) and Sierra Nevada Space Systems for Commercial Crew Integrated Capability (CCiCap) awards totaling $1.1 billion. CiCap is the third round of the agency’s Commercial Crew Program to develop and certify privately operated astronaut taxi systems to restore independent U.S. access to and from the International Space Station by 2017. NASA currently pays Russia for those services. ATK's proposed Liberty Transportation System would combine a launcher made from European and U.S. rocket stages with a composite crew module that was to be built by Lockheed Martin Space Systems of Denver. The rocket would use a shuttle-derived ATK-built solid-fuel core stage and the first stage of Europe's Ariane 5 rocket as an upper stage. The Liberty spacecraft would be based on a design once studied at NASA's Langley Research Center in Hampton, Va., to determine whether composite materials could be used in NASA’s Orion Multi-Purpose Crew Vehicle instead of aluminum lithium. Orion, also to be built by Lockheed Martin, is the deep-space crew capsule NASA plans to pair with the Space Launch System. NASA also received CCiCap proposals from Space Operations, American Aerospace Inc., and Spacedesign Corp., but quickly rejected them as "unacceptable," according to the source selection document. Of the three winners NASA announced Aug. 3, Boeing and SpaceX received $460 million and $440 million, respectively, while Sierra Nevada received $212.5 million. The awards, which run through May 2014, call for Boeing and SpaceX to complete a critical design review that would clear the way for construction of their competing systems to begin. Sierra Nevada’s award, worth less than half of what Boeing and SpaceX stand to receive, is meant to allow development of the company’s winged DreamChaser spacecraft to continue, albeit at a slower pace than Boeing's and SpaceX's capsule-based systems.